The Nazi-era term "Luegenpresse" (lying press) used by anti-immigrant protesters at PEGIDA rallies has been named non-word of the year by German linguists. The country's anti-Islamic movement, criticized for its xenophobic slogans, is on the rise. The use of the term was boosted after an embarrassing incident involving an undercover RTL reporter who gave an interview to a rival network posing as a PEGIDA protester in Dresden in December. He said on camera, "When you go out, there really are a lot of Turks. I get on with many of them fine, but it comes to the point where you think 'Are we really still German in Germany?" The journalist was fired. A panel of linguists singled out the phrase out of 730 terms submitted by 1,250 contributors. Professor at the Technical University Darmstadt and head of the six-member jury, Nina Janich, has described "Luegenpresse", which came to be used in Germany by critics of the free press during WW1, as a word “contaminated by the Nazis." "It's used deliberately in the PEGIDA movement to steer it against those [in the media] who criticize their movement," Reuters has quoted her as saying. Janich noted that the term was used by the Nazis to “slander the media as a whole." “Such a sweeping condemnation hinders sound media criticism and thus contributes to the endangerment of press freedom, which is so important for democracy," she told The Local. A record 25,000 anti-Islam PEGIDA protesters marched through the city of Dresden in eastern Germany on Monday, some holding banners with anti-immigrant slogans, in the largest such rally to date. They chanted "Luegenpresse, halt die Fresse" (Shut up, lying press). The demo was the 12th in a series of weekly protests that seek to “protect” European culture and Christian values against “growing Islamization.” Germany’s notorious Nazi past has been among the reasons for the country’s liberal asylum laws and the policy of multiculturalism. As a result, the number of asylum seekers has risen fourfold since 2012. 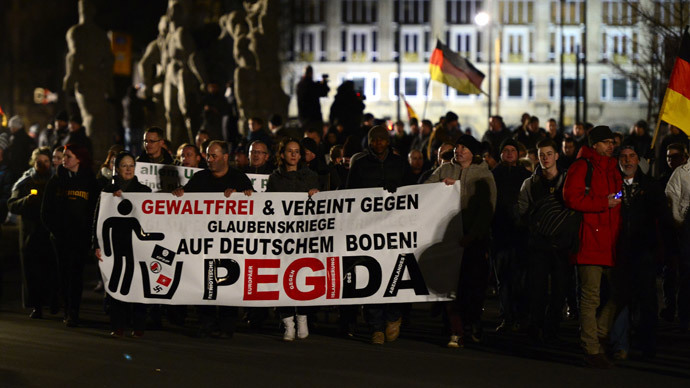 PEGIDA is demanding a new immigration law that would see immigrants forced to integrate and that would make sure Islamists going to fight in Syria and Iraq never return to Germany. Nearly 100,000 people joined ‘unity and tolerance’counter-demonstrations against racism in other marches across Germany, however. Chancellor Angela Merkel and President Joachim Gauck joined the rally, organized by the country's Muslim community and Turkish groups, in Berlin. Since 1991, the jury has annually picked up the most offensive "Unwort des Jahres" (Non-Word of the Year) to "promote awareness and sensitivity of language." On Tuesday, the jury cited two other terms as runners-up: "enhanced interrogation techniques" ("erweiterte Verhoermethoden") as a euphemism for "torture," and "Russia apologist" ("Russland-Versteher") used to describe Germans who support Russia's point of view in the Ukraine crisis. Previous non-words of the year featured "Doener-Morde" (doener killings), referring to a series of neo-Nazi killings of Turks; and "alternativlos" (no alternatives), used by Chancellor Angela Merkel to refer to Berlin's unpopular support for struggling euro zone states.